The Mackinac Center continues to be the go-to source for free-market perspectives in Michigan — especially for media outlets. Over the first few months of this year, we’ve had the opportunity to speak on a variety of issues on the local, state and national level. 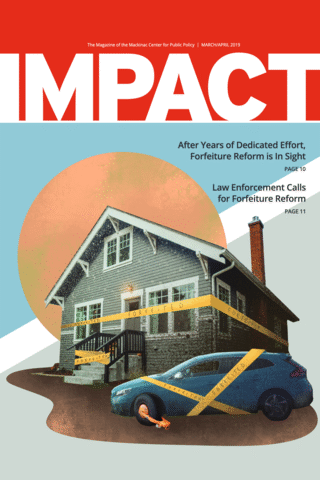 We kicked off the year with commentaries on the first item of the Legislature’s agenda — civil asset forfeiture. We’ve done a lot of work on this topic (you can read more about that in this issue of IMPACT), which many news publishers recognized, including the Detroit Free Press, The Detroit News and Bridge Magazine. Jarrett Skorup, our director of communications and marketing, and resident expert on forfeiture, also spoke to multiple radio shows across the state on the topic. The Mackinac Center released the 2018 Michigan Public High School Context and Performance Report Card, which gives parents an updated tool for comparing schools while taking into consideration their various demographic profiles. Local newspapers like The Monroe News, The Antrim Review, Gaylord Herald Times and even MLive took the opportunity to recognize how schools in their areas performed (both positively and negatively). The release of the governor’s first budget proposal gave plenty of opportunities for our fiscal policy staff to provide analysis on state funding — primarily roads. Not only were they featured in nearly all of the usual statewide print and radio outlets, but their ideas were also featured in an op-ed in Bridge Magazine written by Sen. Peter Lucido.